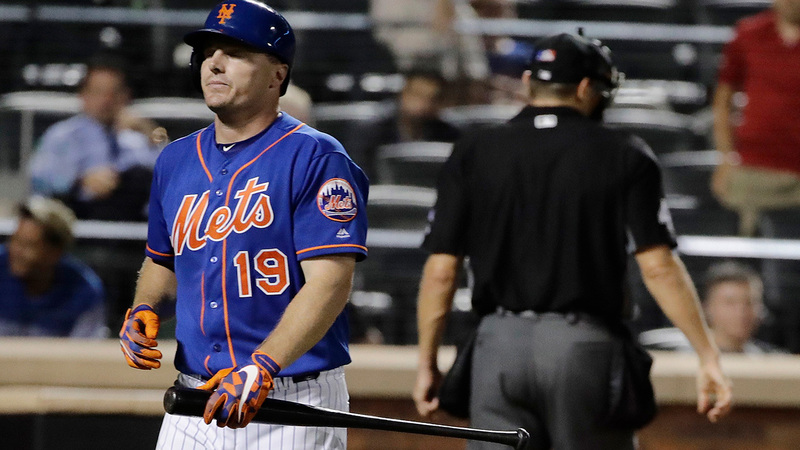 New York Mets' Jay Bruce (19) reacts after striking out to end a baseball game against the St. Louis Cardinals on Tuesday, July 18, 2017, in New York. The Cardinals won 5-0. FLUSHING, Queens (WABC) -- In the words of Boz Scaggs, "Why can't you just get it through your head? It's over. It's over now." Yes, Mets fans, it's officially time to look forward to next season. You can blame injuries, bad luck or whatever you want, but the 2017 New York Mets will be remembered as a major disappointment. The trade deadline is July 31, and it's time for the Mets to cut their losses and move on. The final blow was a decent 6-4 home stand, but they needed to be 9-1 to have any hope for postseason. It's time to start restocking a pretty bare farm system, so what should the Mets do? The first step is a no brainer: Bring up prized prospect Amed Rosario and put him at shortstop for the next decade. It's safe to say that Mets fans have seen enough of Jose Reyes, and it's time for the Rosario era to begin. The kid should play every day at the Major League level and start getting experience right away. The next thing to do is to unload as many free-agents-to-be as possible while bringing back some prospects. The good thing is there are so many teams still in the race that some of these pieces might bring back some value. For one, Addison Reed is a reliable set up man/closer, and just about any team in the hunt is always looking to upgrade its bullpen. Next, Neil Walker is a veteran second baseman who can switch hit for power and is a great clubhouse guy as well. He needs to return from injury to show he is healthy and can help a contender. Asdrubal Cabrera is another infielder who can switch hit and has power. He has lost a step defensively, but a team like Cleveland has shown interest in him. It's also definitely time to dump Lucas Duda, and there might be a team interested in a power hitting left-handed bat. Duda is too streaky and injury prone for the Mets to consider bringing him back. Finally, there is Jay Bruce. He's had an excellent season and is a standup guy who the Mets might want to keep, but he is also the player who could bring back a better prospect. Don't expect any top prospects coming to the Mets system, but maybe this team can get lucky with what they bring back. No matter what, Sandy Alderson has his work cut out for him, as the Mets look to the future starting now.